MARA is a mind‐bending, high‐octane dance, music and multimedia production that brings to life the diabolical, devious character, Mara from Buddhist lore, in a visually entrancing exploration of the human mind and all its intricacies. Stunning synchrony of movement by classical Indian dancers and boldly innovative live music ‐ a powerful, heady mix of Indian ragas, brass band jazz, modern funk and global rhythms ‐ intersects with multimedia projections and experimental staging. This original production created by the LA-based brother‐sister duo Aditya and Mythili Prakash blends poetry with dance choreographed by Mythili Prakash and performed by the Shakti Dance Company along with music composed and performed by the AP Ensemble. Mythili Prakash is a dancer and choreographer specializing in Bharatanatyam, a classical dance form originating in Southern India. Recognized as one of the world’s leading young exponents of Bharatanatyam, her classical, yet inventive approach revitalizes the physicality, musicality and expressive theatricality of the dance to create an exceptional style that is distinct and meaningful. As a first-generation American-born Indian, Mythili is a young woman straddling two worlds. Already the recipient of critical acclaim from Bharata Natyam cognoscenti and adored by Indian audiences worldwide, her mission is to transcend cultural barriers and bring her beloved Bharatanatyam into the mainstream of American arts. Celebrated for her technical and virtuosic skill, Mythili remains, first and foremost, firmly rooted in the tradition’s innate spirituality. It is this – the spiritual resonance of the dance tradition – that provides her inspiration. 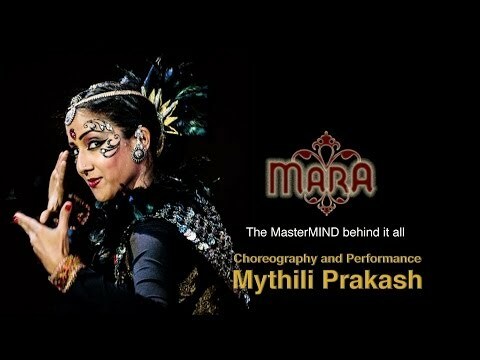 Young Mythili Prakash, now a highly sought after artiste, is a mature performer, her total involvement in the moment of the dance, imparting to her performance a special intensity. Mythili’s welcoming presence and stellar technique left a buzz of new interest in the genre [Bharata Natyam]…. the humongous round of applause proved that she had succeeded in her goal. A hip, young audience understood – and loved – her version of the ancient dance. The evocative physicality is precise, alluring and thrilling. Prakash has a singular presence that invites and fascinates. The creation and presentation is compelling, captivating and extraordinary. A dynamic, powerful, and evocative exploration of the “flame” as a metaphor for life and spirit; A personal story of life and death, passion and seeking. A celebration of the different shades of love through poetry ranging from the 7th to the 21st century. This work highlights the expressive aspect unique to Bharata Natyam, where both dancer and audience journey through the colorful world of love. Contemporary life intersects with mythological story-telling in a fascinating work that extols the sacred energies of the Universe through the tangible and intangible and reflects a unique blend of tradition and innovation in Bharatanatyam.